Children up to 3 years with parents are free of charge. Children from 3 to 12 years with parents have 50% discount. You can bring your pet for 250 CZK per day. Parking is for 150 CZK per day. Halfboard is available for 280 CZK per person / day. Hotel Gold in Cesky Krumlov has very convenient, central location in romantic municipal park on the bank of Vltava river. 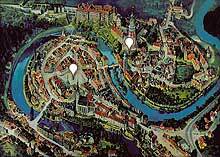 It is near to the main square and all important sights of Cesky Krumlov. Building of the hotel is originaly from 16th century and it used to be Jesuit College. Last reconstruction took place in 2002 (after big flood). Reception with wide range of services is at your disposal non-stop. Tickets, trips, golf and other courses arrangements are provided as well as laundry / dry service, exchange service or souvenirs. Buffet breakfast is served in elegant hotel restaurant with a nice view of surrounding park. Restaurant with capacity for 60 persons serves Czech and international cuisine meals. In summer is open the terrace with unique view and additional 30 seats. Very good conference, raut or meeting possibilities are in large and nice Regent Hall with wooden painted ceiling and capacity up to 120 persons. Conference equipment is available. There is adjoining Regent bar for up to 20 persons. Big advantage is camera monitored parking area right by the hotel (for 150 CZK per day). There are 27 rooms with total capacity of 55 beds in Cesky Krumlov hotel Gold. Rooms for disabled are available.